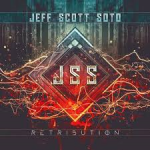 Share the post "Album review: JEFF SCOTT SOTO – Retribution"
You do wonder at times when Jeff Scott Soto (JSS) finds time to rest, as he is involved in the recently released album from Sons Of Apollo, he has his more metal edged Soto band, there is a new W.E.T. album due next year and now we have this solo album from him. Great to see guitarist Howie Simon involved again and he co-wrote all the songs on here with JSS, bar one. On drums is Soto member Edu Cominato. I have not been overly taken by the Soto albums, however the recent Sons Of Apollo album easily makes my top ten of 2017. On a JSS solo album you get a good mix of hard rockers, like the title track and ones that allow JSS to unleash his funkier side, ‘Bullet For My Baby’ is an example of this on the album. ‘Breakout’ reminds you of the much missed Talisman, especially with the call and response chorus, great stuff. ‘Song For Joey’ is a fitting and moving tribute to his brother who died earlier this year. Some lovely keyboards and subtle guitar on this one, with a heartfelt vocal from JSS. Howie Simon is all over the songs with solos, riffs aplenty and some funky bass/guitar playing as required, notably on the aforementioned ‘Bullet For My Baby’. JSS and Simon make a great musical team, bringing the best out in each other’s musical performance. This entry was posted in ALBUM REVIEWS, ALBUM REVIEWS (Mobile), All Posts, The Best of 2017 and tagged album, hard rock, Howie Simon, Jeff Scott Soto, melodic, Retribution, review, rock, Sons Of Apollo, Soto. Bookmark the permalink.